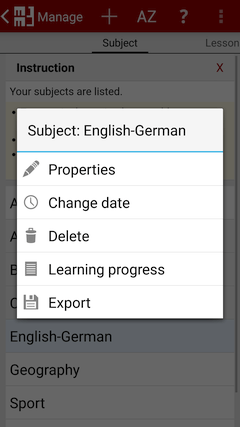 Subject, Lessons as well as Cards: Add, Delete, Rename etc. The TeachingMachine makes it possible for you to group the studying content in subjects and lessons. Every lesson consists of several index cards. Every card contains a question and the necessary answer. Adding a new subject to the list. For each subject, you can specify the languages to be used to label the question&answer and to read it aloud. ascending or descending by name. ascending or descending by creation date. Change the language to be used, see Add subject. Changing the date of the subject. Deleting the subject and all lessons of the subject. You can display and reset your learning progress. Exporting every lesson of the subject as a CSV file into the folder /MM3TeachingMachine/ on the SD card. All lessons of a selected subject are listed. or import a Google Sheet from Google Drive™. 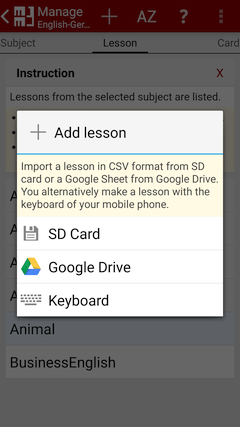 Creating a new lesson at your smartphone respectively. Change possible query directions of the studying content (question&answer). Changing the date of the lesson. Exporting a lesson as a CSV file into the folder /MM3TeachingMachine/subject/ on the SD card. All cards of a select lesson are listed. Add a new card to the lesson. ascending or descending by question or answer. ascending or descending by sequence of the cards. Editing the question&answer at your smartphone. Review and modify your learning progress.